One of my favorite things to do with Josie (my Bolognese) is too curl-up with a good book or watch TV on the sofa together. When we are not relaxing together on the sofa, we enjoy other fun activities like dog agility. 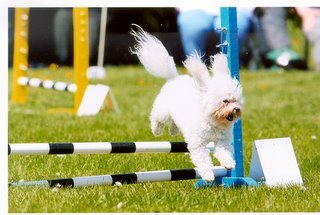 I have been loosely involved with dog agility since Josie was six or seven months old. At the time, I did not know that I should have waited until she was two years old before participating in Agility. Many local canine obedience schools offer agility classes and that is how we got started. It was a great outlet for Josie to show off and to be the center of attention. Since then, we have been taking agility classes at a local agility club. Josie has learned to jump over jumps, run through tunnels and tires, master the titter-totter and conquer dog-walks and walls. Josie needs to learn how to do the weave polls and someday she will. Agility has helped her to build-up her confidence for other activities like adventurous hiking. In addition, it has been a great way for Josie and me to socialize with others. Though we are new comers to the sport, when we appear at events, Josie and I have managed to raise a few eyebrows. We always skip the weave polls but manage to complete most everything else with great speed. For a small size breed that was historically a lap dog of the nobility, they have speed. My little pumpkin girl is not unique. I have heard from other Bolognese owners who have seen their Bolognese run at fast speeds too; sometimes running circles around other dogs. o Use an old coffee table as the table equipment. I use ‘table’ as the command to have her jump up on the table and then I have her down or sit for a few seconds. o Use two empty ice-scream pales (turned-over) at either end with a broom handle balanced on them. I use ‘jump’ as the command. o Unless you have several broom handles on hand, you could purchase dowels from your local home improvement store. Five or six should be more than enough to start. Press the dowels into your lawn so they will be able to stand up on their own. Have them in a straight line and about two feet apart. I use ‘weave’ as the command. Starting from one end of the weave poles to the other end, I try to get her to weave in and out between the poles. This article first appeared in the Bolognese Club of America quarterly newsletter, The Band-Wag-On June 2005. This is more like it, all about me. Boy do I miss doing this. I can't believe it has been 1 1/2 since I have done this, when is mom or dad going to take me to agility once again. I miss it.